40,000 square feet and four stories of watery fun await guests at this Traverse City resort hotel. Eight waterslides and five pools round out the collection of watery fun -- available only for resort guests. Booking Tip: Friday and Saturday nights will be the most expensive, so try and book your stay during the week if possible. 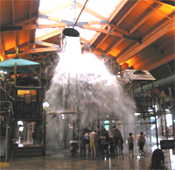 Fort Mackenzie is in the center of it all, a 4-story interactive tree fort features 12 levels of water-based adventure interconnected with suspension bridges, cargo nets and web crawls, as well as over 60 guest-activated water effects. Every 3 to 5 minutes, the huge 48-foot tall bucket at the top of Fort Mackenzie fills with 1,000 gallons of water and dumps over the entire fort and everyone standing below it.